Troy Taormina/USA TODAY SportsNerlens Noel of the 76ers. The Philadelphia 76ers have taken tanking in the NBA to a new level with a losing-is-OK process that is now in its second season and we are starting to see just how bad they can be. 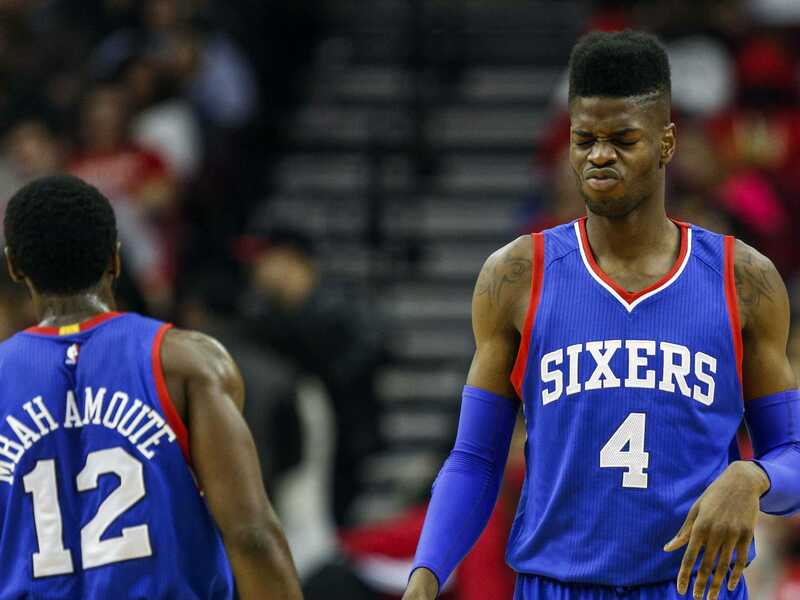 The 2014-15 Philadelphia 76ers are on pace to be the worst team in NBA history. Through ten games, the 76ers are being outscored by 16.9 points, including an embarrassing 53-point loss to the Dallas Mavericks. The NBA record for worst point differential in NBA history belongs to the 1992-93 Mavericks who were outscored by an average of 15.2 points per game. 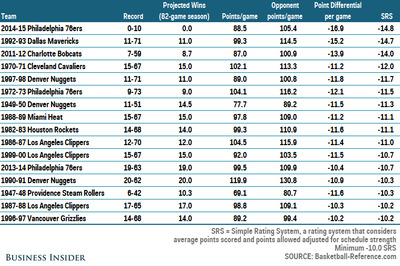 That Mavericks team also has the worst SRS (Simple Rating System) in NBA history at -14.7. 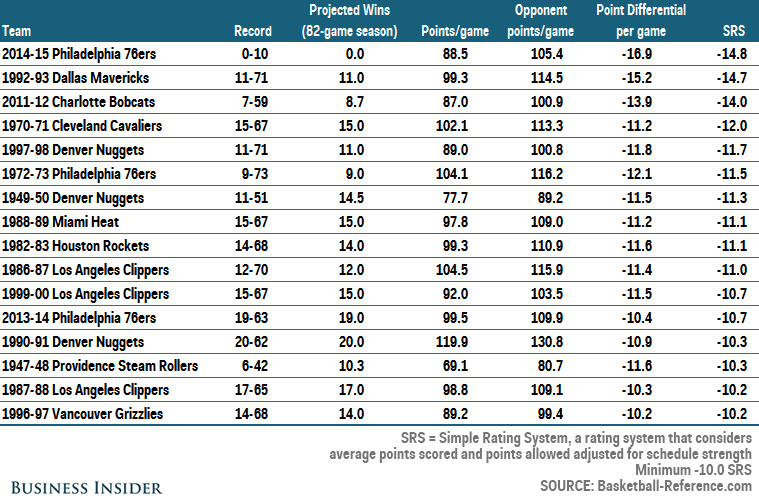 SRS measures teams based on point differential and strength of schedule. This season’s 76ers are currently at -14.8 SRS. It’s early, but that would be the worst in NBA history. Since 1946-47, only 15 teams have posted an SRS or -10.0 or worse. Of those 15 teams, the worst record belongs to the 2011-12 Charlotte Bobcats who won just seven games in the lockout-shortened season, a mark that projects to just under nine wins over a full season. The 76ers are worse than that Bobcats team but there is hope for their fans. The 76ers have the reigning rookie of the year in Michael Carter-Williams and rookie Nerlens Noel, the sixth pick in last year’s draft. The 76ers also have Joel Embiid, this year’s third pick, joining the team next season along with two first-round picks, one of which will be among the top four of the draft. But while there is hope, that group is at least 3-4 years away from being ready to compete and that is assuming all of those players develop as expected. In the meantime, the 76ers will be lucky if they win nine games this season and could go down as the worst team in history.